Viola "Vi" Wild's love of helping others was a central theme throughout her life. Through a Charitable Gift Annuity (CGA) she established at the Oklahoma City Community Foundation, she will continue to help others even after her death. Graduating from Clinton High School in 1943, she declined a scholarship to attend Phillips University in Enid so she could begin working and help the family financially so her younger siblings could also obtain a high school education. After nearly 38 years of service with Southwestern Bell, she retired in 1981. She and her husband, Bob, spent much of their time volunteering together at charitable organizations including Church of the Servant, Skyline Urban Ministries and Lyric Theatre and supported these organizations through their charitable giving. After her husband's death, Vi established a CGA at the Oklahoma City Community Foundation to continue helping the organizations important to her, and also provide her with a reliable stream of income to assist with her day-to-day expenses. 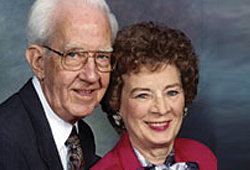 Following her death in August 2009, the remaining CGA assets established the Robert E. and Viola M. Wild Legacy Fund to support the charitable projects they had cared about as a couple. A CGA is a simple and affordable way to make a charitable gift and the annuity income isn't impacted by market fluctuations or the economy. We offer six CGA options that are designed to meet your clients' unique needs. For more information contact Joe Carter at 405/606-2914.